Photo: donated to the HSI slide library by Chanin Thorut. 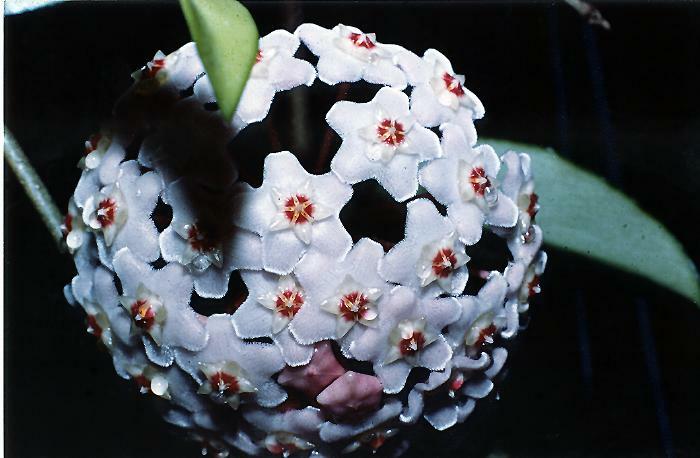 Hoya australis (R. Br.) subsp. oramicola (Hill) P. Forster & D. Liddle. 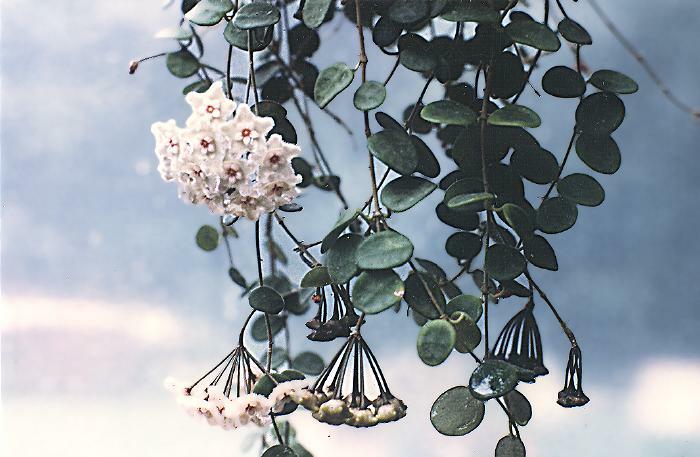 This plant is a rather shy bloomer but is very desirable for its stocky growth and thick, shiny, succulent leaves - more like a Crassula than a Hoya. When it does flower, the flowers are white, in umbels of 25 to 30 flowers, with a heavy honeysuckle scent. Umbels are ageotropic. It is native to the Northern Territory of Australia. 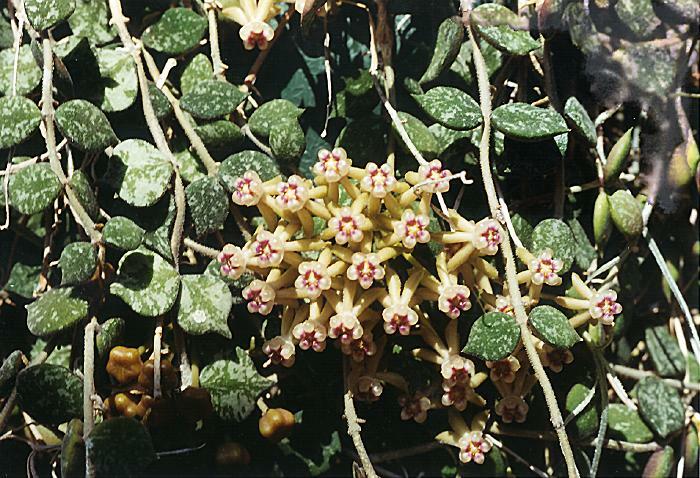 Similar subspecies of Hoya australis are rupicola and saniae. 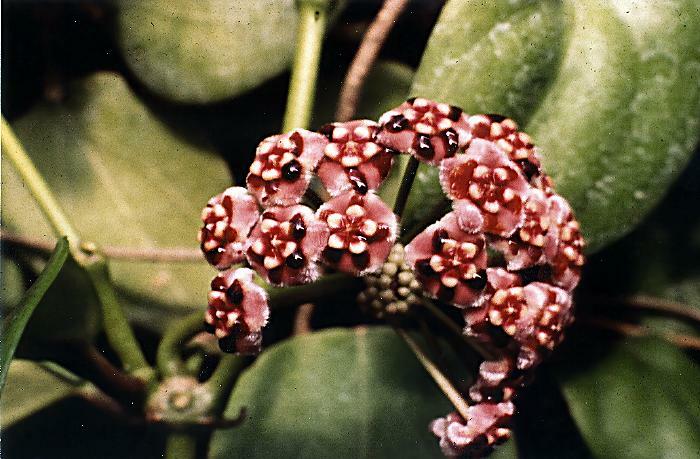 Hoya carnosa, (L. f.) R. Br. This is the easiest to find and probably the easiest to grow of all hoyas. 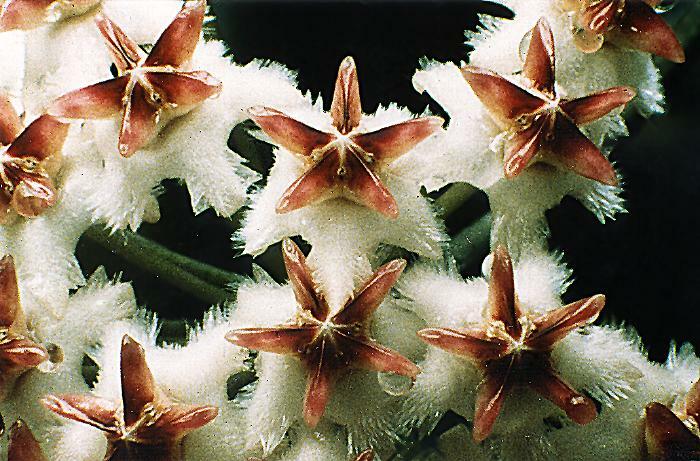 It is the type of the genus and one of the few that differs from other species in its lack of milky-white sap. The sap of this species is the colour of maple-syrup and its taste is also similar. H. carnosa is so common that you are unlikely to find it in nurseries and if you ask why, the nurseryman will most likely tell you that he can't sell it because everyone who wants one already has a plant. Specimens of H. carnosa are handed down in families like heirlooms. Many H. carnosa owners keep numerous pots of it growing on benches beside their main plants, just to give to visitors who admire it and express a wish to have a start. A new acquaintance of mine reported that she was warned by an old acquaintance that, "If you don't want one of her hoyas, don't ever go to see her." Old or common, notwithstanding, H. carnosa is still the very bestHoya there is. It has only one drawback. The fragrance is so overpowering at night that it can drive you out of the house. When it is blooming (here, that's about 10 months of the year), you'll be happier if there is a door to close between you and it as soon as the sun goes down. This species has quite succulent leaves but the stalks are rather woody. 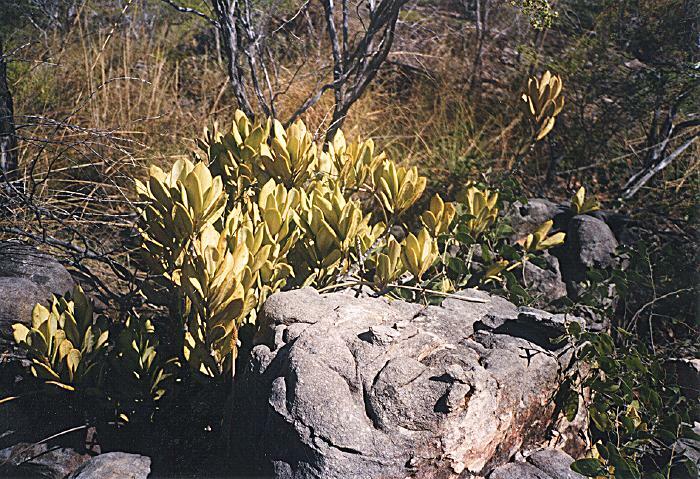 A persistent rumour saying that it is native to Australia is completely false. 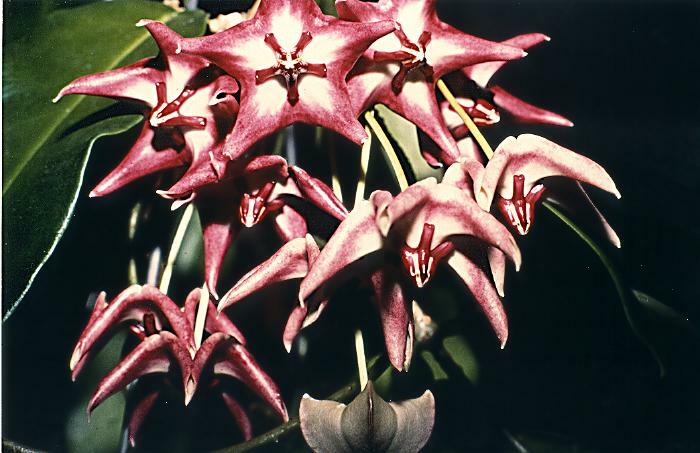 It is native to China and has never been found growing naturally in Australia. The name means "red crowned." This one looks very ordinary until it blooms. It's a rather shy bloomer until it is several years old but the flowers are well worth waiting for. One author recently "sunk" this name into synonymy with Hoya mindorensis (see below). The two species are quite different. Hoya imbricata, Callery ex Decne. 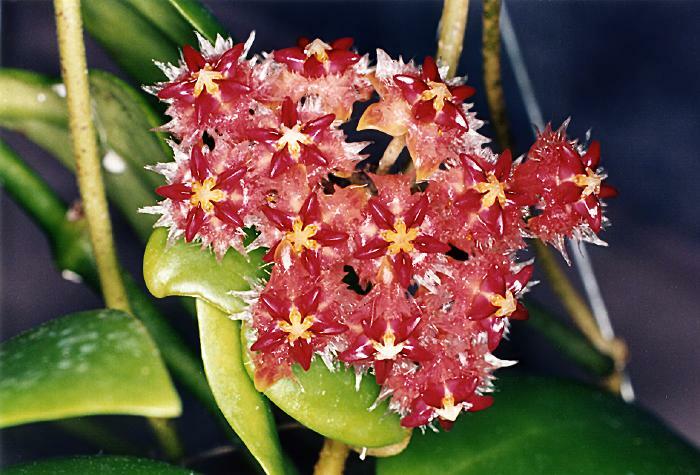 This hoya has one large, peltate leaf per node and grows closely hugging tree trunks, with the leaves forming shelter for ants. 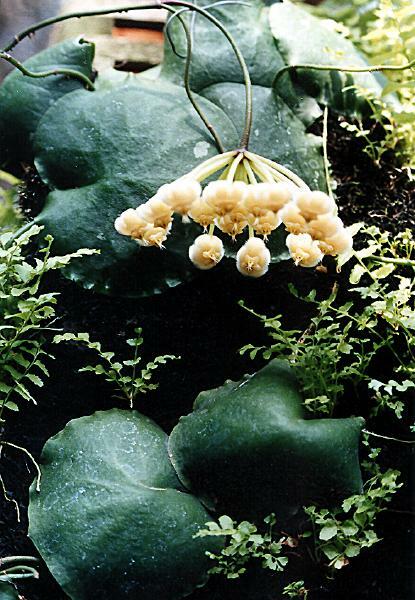 Although considered a true succulent, it is more often lost from too little than too much water and grows best mounted on cork or tree fern bark, in a constant mist. This is native to the Philippines, Sulawesi and the Moluccas. Photo: donated to the HSI slide library by Lois A. Duffey. One of several giant hoyas. Several clones of this are in circulation. 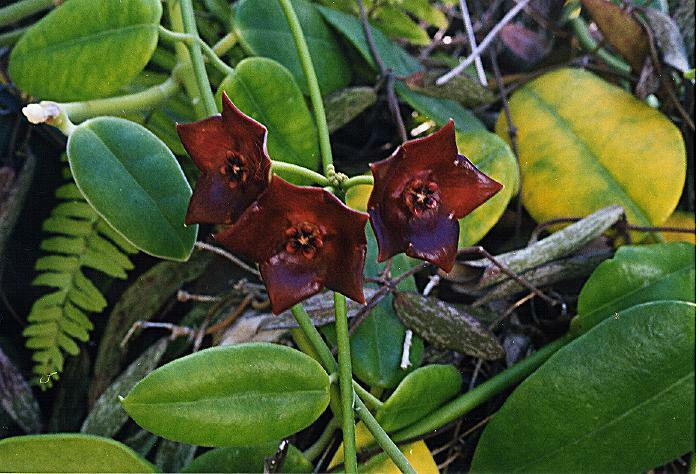 This one, with its huge reddish-brownish-purple flowers is the best known but there is also a pink one and a yellow one. The yellow clone has slightly larger flowers. The entire plant is large with extremely thick stalks. This is definitely not a light shelf subject. This Borneo native is also found in the Philippines. There is some doubt about the correctness of this name. 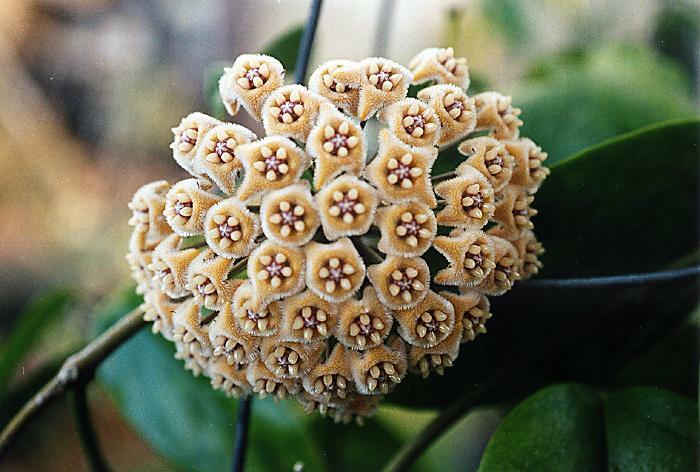 Current information indicates that it is probably a larger flowered clone of Hoya diversifolia, Blume. Regardless of what it is called, it is a lovely, very succulent plant. The dark round spots in the centres of the flowers is sap that exudes from the nectaries found at the base of the central column. When growing this one indoors, care should be taken to protect furniture, rugs and upholstery from the sap, which stains and attracts insects. 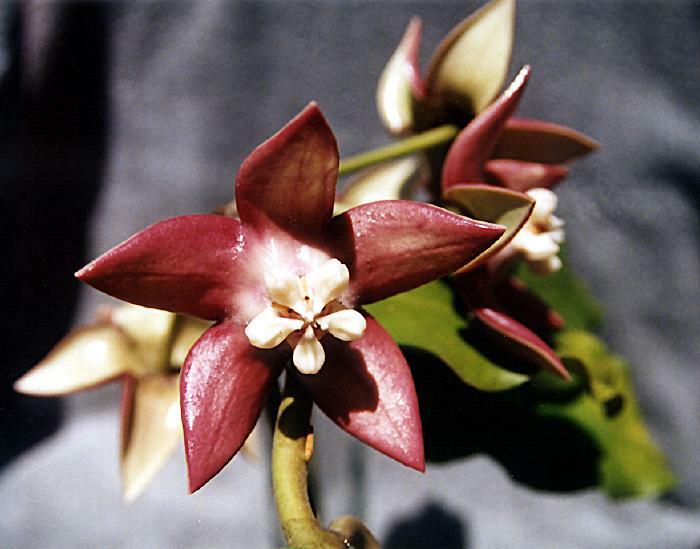 Two clones of this Philippine native are currently in circulation, one with bubble-gum pink flowers and the other with flowers that are nearly true red. The coronas are covered with long stiff white hairs. 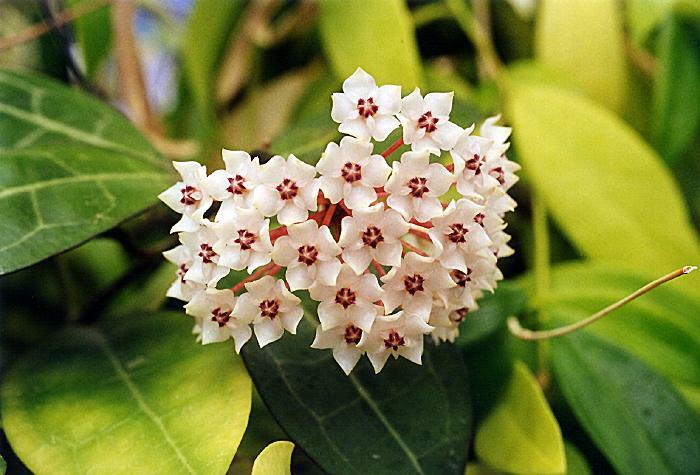 This beauty was mistakenly circulated as Hoya macgillivrayi, F. M. Bailey, for many years. It is very similar, but still sufficiently different to stand as a species. Its name is derived from the Greek word, "onyx," which means "talons" or "claws," and "oides," a suffix meaning, "like." The curled up petals certainly do look like "claws." The flowers are very variable in colour, ranging from white to deep wine-red and shades in between. Sometimes one can find all shades in an umbel at the same time. This one has extremely slender stalks but the leaves are thick and succulent with petioles that are often thicker than the stalks. The peduncles are long and very slender also. It is amazing to see such thick and heavy leaves and flowers held up on such slender supports. In addition to all its other attributes, the scent is like that of an expensive perfume and not in the least bit cloying. This is a native to the Cape York Peninsula of Queensland, Australia. 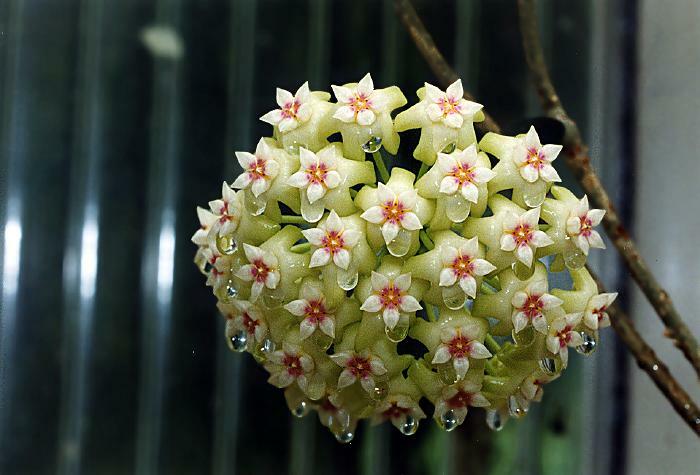 This Hoya is from north-eastern Thailand. 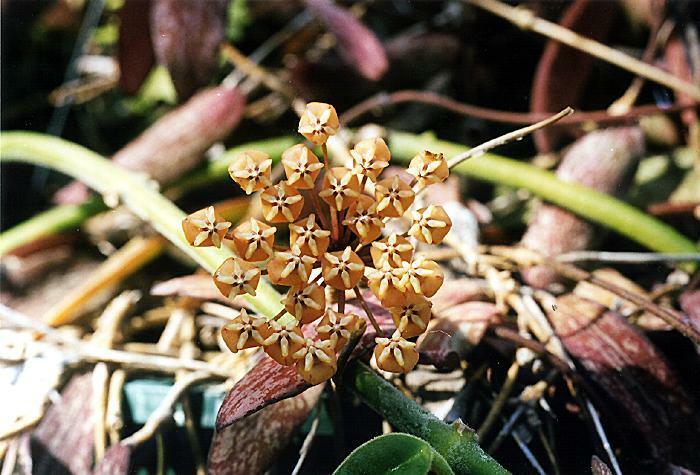 It has leaves that are sometimes as much as a quarter of an inch thick. These oblong leaves are covered with short hairs and have a pair of rather faint, but still visible basal veins running almost parallel to the midrib. 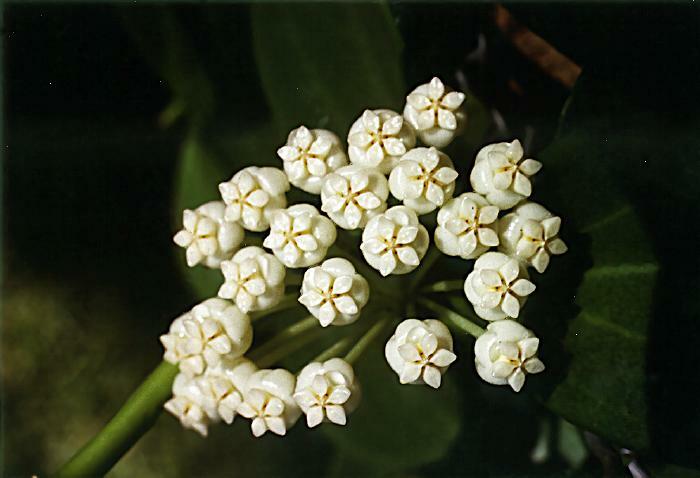 The flowers are creamy white, numerous and frequent. They have a pleasant, but not overpowering, citrus scent. This is a very compact grower that tends to trail, rather than climb, due, not doubt, to the heaviness of the leaves and stalks. 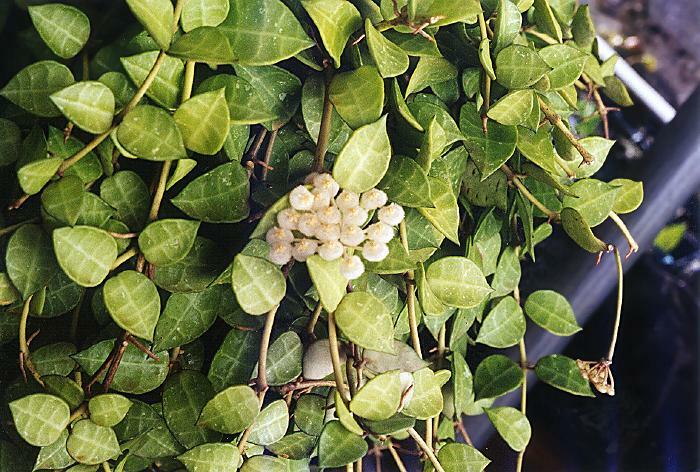 There is a similar hoya from the same area, having round leaves. 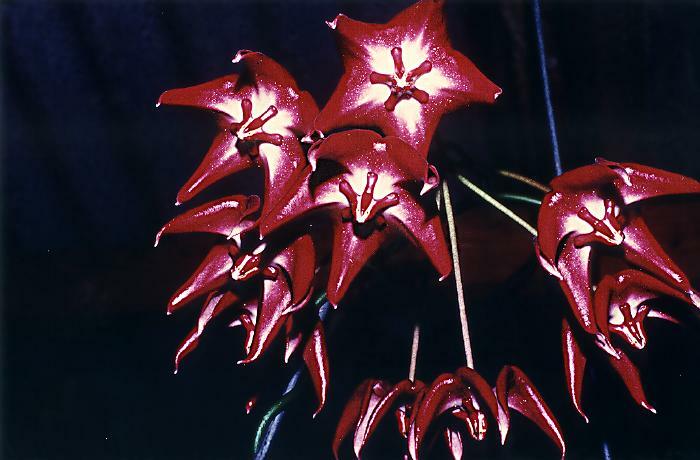 It greatly resembles Hoya pachyclada and it is sold as Hoya pachyclada by most dealers. Recent microscopic studies have revealed broad differences in the flowers of the two plants that can't be seen by the naked eye. It is almost certain that two species are represented here. 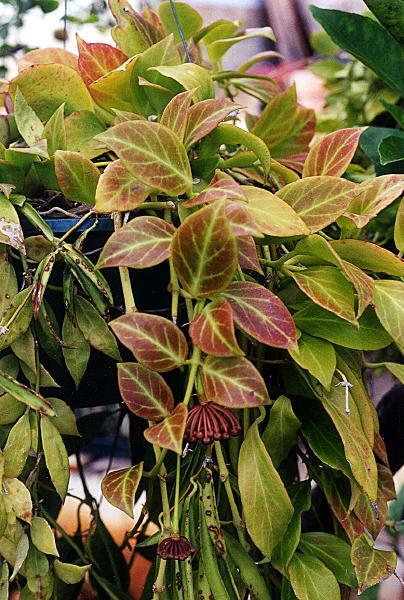 These hoyas are among the tidiest of hoyas and are certainly the most compact growers. Stalks of a mature plant can measure as much as an inch in diameter. This wee creeper was named for its habit of creeping along the ground and along the branches of trees and shrubs. It has travelled about in collections under a lot of different wrong names and continues to be mislabelled in some collections. It is a bit difficult to grow and many report success in terrariums. The picture is very close to life size. The flowers begin greenish white and change colour with age, from white to green and finally pink. Hoya Picture Gallery Click on images to expand them. H. carnosa (L. f.) R. Br. 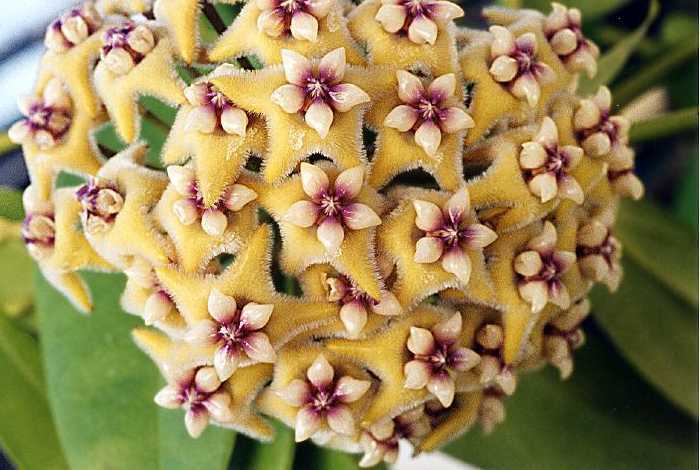 Unknown Hoya aff. 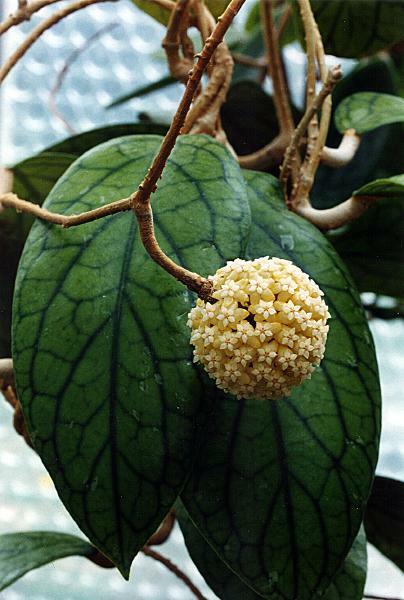 H. hasseltiii, Miq.